Topics: Stoneworks, Contract, and Natural Stone. 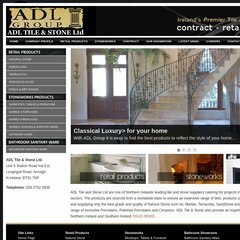 adlgroup.co.uk Marble Fireplaces - Bespoke Fire Surrounds, Hearths, Feature Walls ..
adlgroup.co.uk Natural Stone - Floor & Wall Tiles, Marble, Travertine, Limestone ..
adlgroup.co.uk Bathrooms Sanitary Ware - Bathtubs, Showers, Sinks, Taps, Jacuzzi ..
adlgroup.co.uk Retail Products ADL Group, Tiles, Natural Stone, Marble, Polished .. The programming language environment is PleskWin. There are 2 Nameservers, ns2.dfsv27.com, and ns1.dfsv27.com. Dfl-net (England, Dorset) is the location of the Microsoft-IIS/6 server. PING (91.103.216.191) 56(84) bytes of data.